The spring season is upon us. To be sure that you enjoy a progressive and injury free season, Excel strongly recommends that you get your body ready. What do Tiger Woods, Jack Nicklaus, Fred Couples and Davis Love III have in common, besides the ability to hit a golf ball farther than most mortal men? All have missed significant time during their playing careers because of lower back pain. And they’re not alone. Approximately one third of professional golfers and one half of recreational golfers suffer from lower back pain. 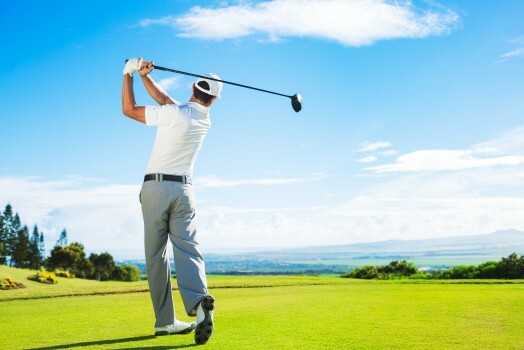 According to Dr. Vijay Vad at Hospital for Special Surgery studies have shown that those golfers who did suffer from lower back pain had substantially less mobility in their lead hip (which is the left hip for a right-handed golfer and the opposite for the southpaw) than those players with healthy backs. Repetitive stresses placed on the joints in the lower back, due to a lack of internal rotation in the lead hip after impact with the golf ball–or during the deceleration phase of the swing–was the primary cause of back trouble. Lower back injuries are very common this time of year, when many recreational golfers are breaking out their clubs for the first time in months. A weak, deconditioned core–the muscles and tendons that make up the midsection of the body, including the hips, “glutes,” hamstrings and abdominals–is a contributing factor. Most people just aren’t physically ready to play 18 holes of golf right out of the gate; therefore they are more susceptible to injuries. It also doesn’t help that the vast majority of recreational golfers sit behind a desk for 8 to 10 hours a day. This creates shortened hip flexor muscles, leading to more back pain in golfers. Other common golf-related injuries include those to the wrists, elbows, and shoulders. Pre-season golf conditioning can prevent these injuries and also serves as a performance enhancement tool during the season for more yards on drives. The first step toward injury prevention is a thorough physical competency assessment. The Golf Physical Competency Assessment (GPCA) establishes a starting point for training. Trunk, shoulder and hip mobility; Core, lower and upper extremity strength; Muscular flexibility; Balance. Have you paid any attention to these physical attributes during this past long winter? The GPCA will assess muscular flexibility; spinal, hip and shoulder mobility; core, upper and lower extremity strength and overall balance. The results of the GPCA will identify areas of strength and weakness, deficiencies and limitations and therefore allow for the development of individually prescribed exercise routines.